New research on wind behavior in complex terrain, led by NOAA and the U.S. Department of Energy, will improve forecasts for wind energy firms by 15-25 percent, and improve wind forecasts for the entire country, scientists said. The Wind Forecast Improvement Project 2, or WFIP2, focused on improving NOAA’s short-term weather forecasts of wind speeds in areas such as mountains, canyons, and coastlines, landforms often associated with abundant wind energy potential. The project was based in the windswept Columbia River Gorge in Washington and Oregon, where wind farms can generate as much power as five 800-megawatt nuclear power plants. Researchers collected 18 months of data to better understand how terrain and weather physics affect forecasts of wind speed and turbulence at the height of wind turbines, data that researchers then used to improve the High Resolution Rapid Refresh (HRRR) short-term weather model’s representation of low-level winds. The scope of the project was unprecedented, with more than 200 instruments deployed across 50,000 square kilometers. Map showing the WFIP2 region of study and the arrangement of select instruments. The Columbia River Gorge is a deep canyon carved by the Columbia River stretching for more than 80 miles from high desert through the Cascade Range. The dramatic topography of the gorge creates highly variable wind conditions - weather fronts, mountain waves, topographic wakes, thunderstorm outflows, cold pools and marine pushes - either triggered or amplified by the terrain, which impact how much electricity wind turbines can generate. 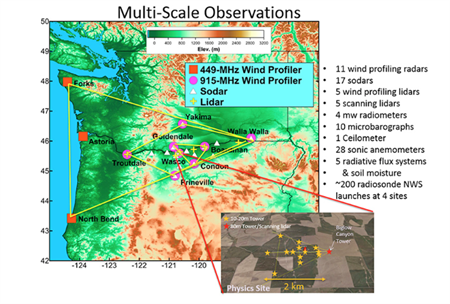 Once the field project ended in 2017, the researchers produced a comprehensive dataset of meteorological processes that allowed NOAA modelers to solve a problem that had long vexed grid operators: more accurate predictions of the transition between cold, stable air to windy conditions, transitions that often result in a surge of power generated by wind turbines. Previously, weather models have been too aggressive in their predictions, resulting in over-estimates of power surges and false alarms for wind ramp-ups. Data collected during WFIP 2 allowed a NOAA modeling team to improve wind forecasts by 15-25 percent depending on weather conditions, with the best results in the winter when cold pools are more common. 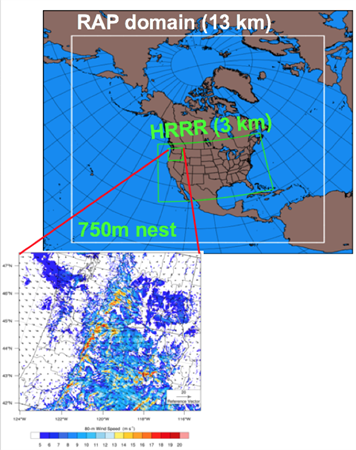 The models used for the project were the 13 km grid Rapid Refresh (RAP) model, the 3 km grid High-Resolution Rapid Refresh (HRRR) model, and a 0.75 km nest within the HRRR that provide high-resolution forecasts. Researchers demonstrated that the updated HRRR, which incorporated changes resulting from the WFIP2 analysis, also improved wind forecasts in other regions across the United States. This new version of HRRR became operational at NOAA’s National Center for Environmental Prediction in July 2018. Led by NOAA and the Department of Energy, WFIP2 brought together researchers, instruments and other resources from the NOAA Earth System Research Laboratory, CIRES, the NOAA Air Resources Laboratory Field Research Division, multiple DOE laboratories, Vaisala Inc., and other private companies, and universities. For more information, contact Theo Stein, NOAA Communications , at (303) 497-6288 or theo.stein@noaa.gov.